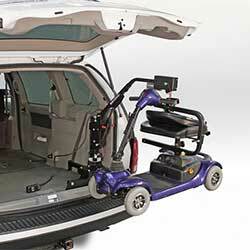 Increase your mobility with a vehicle or platform wheelchair lift. Read about the best wheelchair lift brands, check out buying tips and browse consumer reviews. 101 Mobility sells solutions for those with physical restraints. Its products include wheelchair lifts for your vehicle and platform wheelchair lifts for your home or business. 101 Mobility offers wheelchair lifts from multiple brands like Bruno and Harmar. Vehicle lifts start around $1,245.75 while platform lifts are around $4,100. Garaventa Lift manufactures accessibility products including inclined, vertical and portable wheelchair lifts. Choose from seven models of platform wheelchair lifts and three models of portable lifts. 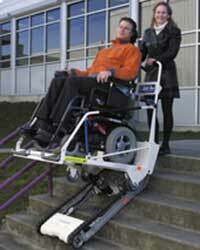 Garaventa Lift designs wheelchair lifts to carry up to 750 pounds and raise up to 50 feet. Platform lifts are priced around $4,000 to $6,000. Bruno engineers and manufactures indoor and outdoor stairlifts as well as vertical platform and vehicle wheelchair and power scooter lifts. Wheelchair lifts for your vehicle are priced around $1,999 to $3,000. We evaluated 22 wheelchair lift companies and found the three best choices. We carefully considered cost, customer service, manufacturing practices, safety features, expert rankings and other criteria in our evaluations. The three best wheelchair lift companies are 101 Mobility, Garaventa Lifts and Bruno. In this guide, we discuss wheelchair lift features with tips for choosing the best lift for your needs. We share our detailed evaluations of our top companies, and you will also find helpful frequently asked questions about wheelchair lifts. If you have a caregiver, consider a portable wheelchair lift for convenience. Make a note of wheelchair lift safety features you want and make these a priority when shopping. Choose a wheelchair lift that should be suitable for your needs well into the future. A wheelchair lift is a secure platform raised and lowered by a powerful motor. These lifts can be used to lift the chair alone or an occupied wheelchair to and from a vehicle or over stairs. Wheelchair lifts install on vans or, in homes or businesses where the lifts provide wheelchair access to upper floors with no elevators. Lifts conveniently move a wheelchair from the parking lot to the vehicle, or from the front porch on the house to the sidewalk or driveway. A wheelchair lift is significantly different from a stair lift with a permanently-attached seat which only accommodates the rider, not the passenger and wheelchair. The three primary types of wheelchair lifts are vertical platform lifts, inclined platform lifts, and hoist lifts. You will find many subcategories for wheelchair lifts, including portable versions. Vertical Platform Wheelchair Lifts: The platform on an inclined lift tilts on an angle rather than remaining horizontal and moves up and down stairs similar to the action of an escalator. As with vertical platform lifts, inclined platform wheelchair lifts are designed to transport a person seated in the chair. We found several portable inclined platform wheelchair lifts which were useful for making areas with no ramp accessible for wheelchairs. Crane or Hoist Wheelchair Lifts: Crane wheelchair lifts are less common compared to other types of lifts and are most commonly used to lift a wheelchair or scooter into a vehicle without someone seated in them. Crane lifts have no platform and work much like construction cranes. The base installs inside the back of a van or a pickup truck with a rotating arm used to hoist the wheelchair or scooter to the level of the vehicle, then safely lower the wheelchair for safe transport. Inclined Platform Wheelchair Lifts: The platform on an inclined lift tilts on an angle rather than remaining horizontal and moves up and down stairs similar to the action of an escalator. As with vertical platform lifts, inclined platform wheelchair lifts are designed to transport a person seated in the chair. We found several portable inclined platform wheelchair lifts which were useful for making areas with no ramp wheelchair accessible. Auto Lifts for Wheelchairs: Auto or vehicle lifts are usually used to transport an unoccupied wheelchair, and while most are large platform lifts, there are many specialized auto lifts. – Interior and Exterior Auto Lifts: Interior auto lifts raise the wheelchair and then lift it into a van or a pickup truck bed. Interior auto lifts can be platform or crane lifts. Exterior auto lifts also raise the chair or scooter, then hold it behind the vehicle’s trunk transport, similar to bicycle racks you may have seen on the back of a car. Exterior lifts are convenient for use on smaller vehicles such as sedans or SUVs. – Single Arm and Double Arm Lifts: Single arm or double arm refers to the number of support beams on an auto wheelchair lift. Most auto lifts use a single arm, with double arm units reserved for higher weight capacity and stability during lifting. – External, Internal or Under-Vehicle Mount: A vehicle wheelchair lift mounting refers to where the lift is housed on the vehicle when not in use. External mounts install outside the car, often behind the trunk. Internal mount lifts store inside of a van or truck bed. Under vehicle mounts hold the lift underneath a vehicle, sliding out when needed to raise the wheelchair. Under vehicle mounts save cargo space but cost more, reduce vehicle ground clearance and are typically more difficult to maintain. Wheelchair lift safety equipment is vital, whether you buy a wheelchair lift designed to move a person seated in the chair or just the chair itself. Tie-downs keep wheelchair lifts stationary when not in use, and non-slip surfaces and control lock switches are vital safety features. Safety features for wheelchair lifts designed to move an occupied chair are far more extensive. However, models vary and not all safety features may be available with all units. Obstacle detection is particularly crucial for vertical platform wheelchair lifts where the user may not be able to see what is beneath the platform. This safety feature works much like a garage door obstruction sensor to automatically stop the lift if an obstacle is detected. Safety railings or straps are a must-have safety feature on both vertical lift platforms and inclined platforms to prevent the wheelchair from moving or falling off the platform while in motion. Safety rails and straps come in a variety of heights and sturdiness levels. The type of track or other enclosure used with outdoor lifts must align with the weather in the lift location. For example, higher rails with solid barriers are required in windy areas for the rider’s safety and comfort. Continuous pressure controls require the operator to hold down a control button to keep the lift in motion to ensure the operator retains control of the lift at all times. Pressure controls also allow for quick stops in case of an emergency. Emergency stop buttons provide the operator with a way to stop mid-motion quickly with one tap on the button. Emergency stop buttons are critical for lifts with no continuous pressure controls. Backup battery systems allow lifts to operate in the event of a power failure, so riders do not become stranded on the lift. Some wheelchair lifts have a manual movement backup instead of a battery backup, but these require assistance to operate. Electro-interlock gates prevent gates leading to the platform or the platform safety rails from opening while the platform is in motion. Weather-safe controls are a must for outdoor systems where a wheelchair lift is exposed to the elements. Weather-safe controls are sealed to protect the unit from damage while providing safe operation in all weather conditions. The cost of a wheelchair lift depends on weight capacity, size of the lift, whether you use it indoors or outdoors, types of control types and other features. However, we found some typical price ranges you can use when comparing wheelchair lifts. Wheelchair Lift Installation Costs: Installation is not usually included in the cost of a wheelchair lift because so many factors are involved in the process. Installing a wheelchair lift may require a site inspection before determining the total price of the system, which is one reason for significant variations spanning national cost averages. Automotive lifts may have less costly installation if no customization required. Factors involved in the cost of installing a vertical wheelchair lift are permits, the vertical rise, size of the lift platform, platform weight capacity, amount of leveling and ground preparation, and how much electrical work is needed. Incline lifts incur more additional costs for installation than curved stairs and if additional support required if the lift travels a long distance. Cost of Wheelchair Lift Equipment: Vertical platform lifts can have a considerably higher price tag, in part because of self-contained equipment on the lifts. Curved wheelchair lifts require a great deal of careful customization, making these the highest-priced lifts. You may save money if a shorter wheelchair lift will do for moving a few feet from the patio to ground or to bypass a few entryway steps. Prices vary a great deal for auto lifts for wheelchairs. A side slide lift for a van averages between $1,500 and $3,500, hoists start at $3,000 but can easily cost up to $5,000. Rear mounted external lift platforms are smaller with less complicated mechanisms and a more affordable price tag. Like other aging in place costs, you may have concerns about paying for home modifications to place a wheelchair lift or paying for the lift itself. There is currently no Medicare coverage for wheelchair lifts but the relatively new Creating High-Quality Results and Outcomes Necessary to Improve Chronic Care Act (CHRONIC) gives Medicare Advantage plan providers flexibility for adding non-medical coverage for items such as wheelchair lifts. CHRONIC addresses many other health care issues affecting retirees, and expands Medicaid’s Independence at Home program. Implementing CHRONIC will take some time, so the benefits may not be available from your insurance provider for a few months. If you qualify for Medicaid and a wheelchair lift is deemed medically necessary, you may be eligible to have the cost paid for via Medicaid Home and Community Based Services (HCBS) Waivers, depending on your state laws. Many states have resources for those needing a wheelchair lift with discount programs or partial grants. Call your state’s Agency on Aging or Department of Disability Services for information about programs available in your area or for a referral to a local office. Veterans may find help for paying for a van-adapted wheelchair lift through their regional VA office. 1. We searched for an extensive list of 22 wheelchair lift companies. 2. We evaluated wheelchair lift companies based on our expert-guided buying criteria: manufacturing, cost, customer service, safety features, expert rankings and more. 3. We provided you with the best wheelchair lift companies for consideration. 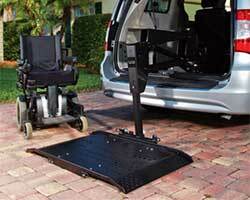 There are a large number of companies selling wheelchair lifts and quite a few manufacturers. Luckily, you don’t have to investigate all these businesses to narrow down your search; we did that hard work for you. Our in-depth wheelchair lift companies analysis focuses on each company’s industry reputation, the variety of offerings and other criteria. We researched global, national and regional wheelchair lift companies. Then we narrowed the list to our top three picks based on specific criteria we set by extensive research of consumer and business information for wheelchair lift sellers and manufacturers. Then we determined which companies offered wheelchair lifts with unique features or helpful services. The result is our list of the best wheelchair lift companies. After our evaluation, we chose the three best wheelchair lift companies: 101 Mobility, Garaventa Lifts and Bruno Independent Living Aids. Each company stood out above the competition. 101 Mobility has been in business since 2008, providing a wide variety of equipment for individuals facing limited mobility. The company offers a range of patient lifts, ramps, residential elevators, stair lifts, bath safety solutions, door openers, vertical wheelchair lifts, inclined wheelchair lifts, and automotive scooter lifts. 101 Mobility rents vertical wheelchair lifts for those expecting to return to full mobility after an accident or injury. 101 Mobility carries a range of wheelchair lifts from several manufacturers including Liftup, Bruno, Hamar, and Pride Mobility. Because the company is a reseller for a wide range of manufacturers, customers have more options compared to shopping a dedicated-line retailer. 101 Mobility sells innovative products such as a vertical lift platform that converts to steps. The company provides a one-year limited service warranty in addition to manufacturer warranties. 101 Mobility is not accredited with the BBB but holds an “A+” rating with five out of five stars. Garaventa Lifts manufactures mobility assistance devices with vertical lifts, inclined lifts, home elevators, evacuation chairs, and portable lifts for both commercial and home use. Every Garaventa wheelchair lift is manufactured to ensure a custom fit. Company-certified technicians complete all installations and provide an equipment demonstration in an instructional session for the customer. Many Garaventa Lifts can carry a weight capacity up to 750 pounds, and Garaventa sells lifts capable of reaching up to 50 feet. The portable wheelchair lifts Garaventa manufactures allow convenient access to more areas than ever before. Finally, the Garaventa Evacu-Trac is an emergency wheelchair lift manually operated by a caregiver during electricity outages. Evacu-Trac is the only emergency model produced with a speed governor and brake for safety. Garaventa Lift is not accredited with the BBB but holds an “A+” rating. Bruno is a family-owned, ISO 9001-certified independent living aid product designer and manufacturer. With 35 years in the mobility equipment business, the company sells to the public and works with the Department of Veterans Affairs. Bruno produces vertical wheelchair lifts, indoor and outdoor stair lifts, and a wide range of automotive wheelchair and scooter lifts, all manufactured and packaged in the U.S. and sold around the world. Bruno’s extensive automotive wheelchair lift line includes platforms, interior lifts, hoists, and quick connect lifts for trailers pulled behind sedans. The company makes and sells a vertical wheelchair lift for indoor or outdoor use that runs up to 14 feet, especially useful for basements and decks. Bruno Independent Living Aids is accredited with the BBB and holds an “A+” rating. Can I install a wheelchair lift myself? Whether or not you can install a wheelchair lift on your own depends on the type of lift and your skills. Vertical wheelchair lift installation is a very involved project and almost always come with a cost. A few incline wheelchair lift manufacturers sell self-install models, but these are extremely limited. Automotive lifts, like vertical lifts, are rarely suitable for DIY projects. While these wheelchair lifts do not all need structural modifications, they usually require specialized tools and knowledge to install safely. Small trailer wheelchair lifts with a trailer hitch only need some minor wiring and are the most likely candidates for a self-install. Can I use an automotive hoist wheelchair lift to move a person? There are specific hoist lifts made for people, and those designed for chairs and scooters are not tested for safely lifting humans. You can’t use an automotive hoist lift to move a person. Is a stair lift the same thing as an inclined wheelchair lift? No, a stair lift is a motorized chair that moves along a staircase, requiring the user to stand and walk to vacate the seat. An inclined wheelchair lift platform holds the chair and occupant while navigating stairs. If I have a wheelchair lift installed on my vehicle, does the lift go with the car if I sell it? Most automotive wheelchair lifts can be removed without damaging the vehicle, although some lifts may leave mounting holes. Van conversions are usually not easily reversible. 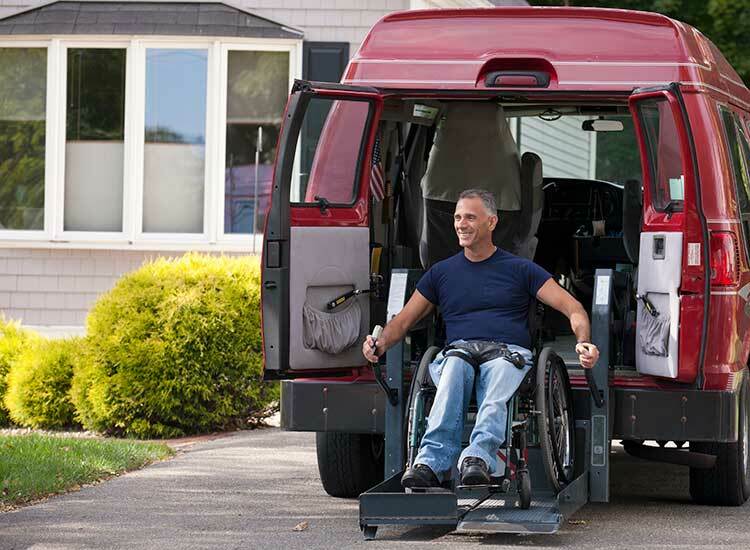 However, the market for vans, trucks and some cars with wheelchair lifts is increasing due to exponential growth in the senior population using wheelchairs and mobility scooters. How does a home elevator differ from a vertical wheelchair lift? A home elevator is typically fully enclosed with a smaller footprint compared to a wheelchair lift and may not safely accommodate all wheelchair sizes. How long does it take to install a wheelchair lift? The time required for wheelchair lift installation varies depending on prep work such as needing to pour a cement base. Most wheelchair lifts install in a few days with minimal disruption to your home and routine. Look for safety features and ease of use before choosing a wheelchair lift, and check out our recommendations for help with defraying costs. Overall, a wheelchair lift can be a vital part of maintaining self-sufficiency. The first step in considering a wheelchair lift is to take a realistic look at your needs vs. the options available. If you only use a wheelchair for mobility and want an automotive lift, you may need to buy a vehicle to be fitted with the lift, or opt for a wheelchair van. The tilt of an incline lift may feel more secure but isn’t the best choice if the stairs are particularly narrow and others frequently need access to the steps. Whatever your needs, there are plenty of options in a variety of price ranges to choose from to help you meet your mobility goals.